Koplev S, Longden J, Ferkinghoff-Borg J, Blicher Bjerregård M, Cox TR, Erler JT, Pedersen JT, Voellmy F, Sommer MOA, Linding R.
Signaling networks are nonlinear and complex, involving a large ensemble of dynamic interaction states that fluctuate in space and time. However, therapeutic strategies, such as combination chemotherapy, rarely consider the timing of drug perturbations. If we are to advance drug discovery for complex diseases, it will be essential to develop methods capable of identifying dynamic cellular responses to clinically relevant perturbations. 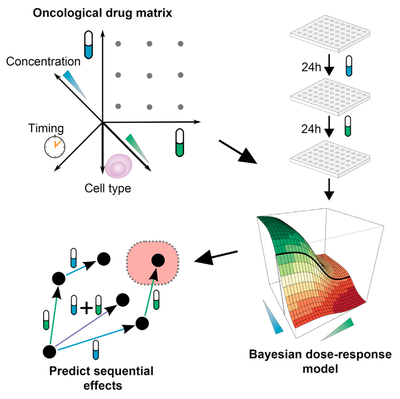 Here, we present a Bayesian dose-response framework and the screening of an oncological drug matrix, comprising 10,000 drug combinations in melanoma and pancreatic cancer cell lines, from which we predict sequentially effective drug combinations. Approximately 23% of the tested combinations showed high-confidence sequential effects (either synergistic or antagonistic), demonstrating that cellular perturbations of many drug combinations have temporal aspects, which are currently both underutilized and poorly understood.